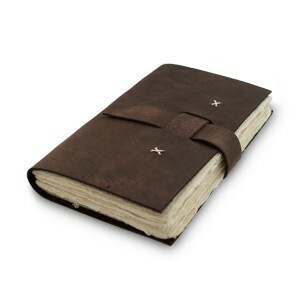 There are rustic leather journals, and then there are rustic leather journals. Many journals now a days lack what makes them truly rustic. They certainly look the part, and may even be distressed in all the right places with “rough cut” paper edges and natural blemishes in the leather. There are many beautiful journals out there, but looks aren’t the whole story. Let’s discover what makes a journal truly rustic. Much of the Western World’s leather is tanned and processed by large companies, and will often use Chrome #3, also known as chromium salts, for the tanning process. There is an older, more traditional way to tan the leather. Let’s take a look at both options. Chrome leather tanning is fast, and thus very appealing to companies large and small to speed up the process. You may or may not have heard of Chrome 3 vs Chrome 6. Chrome 6 (Hexavalent chromium) is hazardous to the environment and should not be used in leather tanning. It is the oxidized form of Chrome 3 and is toxic. Vegetable tanning is the time-tested, traditional approach of tanning the leather, taking much longer to tan. Unfortunately, few journals out there use this approach anymore and opt for the faster chrome tanning process. Leather for the Kathmandu Valley Co. journals is tanned using the vegetable tanning of water buffalo hides. Paper used for “rustic” journals varies, some companies use regular paper (copy/computer paper), kraft paper, or nicer papers such as cotton rag, but there is not much rustic about it other than a rough cut edge that is sometimes added. A truly rustic journal requires paper that is truly rustic. A paper that comes from a time honored tradition stretching back more than 1,000 years is a good place to start. And this paper is hand made. Handmade Lokta paper is an ancient tradition of the Himalayas. It’s crafted from the Lokta bush which grows in Nepal on the slopes of the Himalayan Mountains at an altitude between 5,250 and 13,000 feet. When cut, the Lokta bush regrows quickly and is not used for food by other animals. The fibrous inner bark creates the perfect paper after it is mashed and “cooked” to soften. Then the fibrous mash is spread thin across boxed screens and set to dry in the sun. Small flecks from the outer bark can often be seen in the finished paper as well as the fine texture from the screen where the paper was formed and dried. The paper is highly regarded for its texture and eco-friendly nature, as it is a non-tree based paper. It is also resistant to humidity, bugs, and tearing. Once you see Lokta paper, paper from other rustic journals (although beautiful) doesn’t seem so rustic anymore. Lokta paper can be clean-cut referencing current journal trends, or be left with a deckle edge which offers the ultimate rustic experience. It’s like rough cut, but more true to ancient book and codex paper binding. Crafting the leather and the paper together to complete a beautiful rustic sketchbook or journal should be done only by hand to make a rustic piece of art that you can be proud to carry with you. 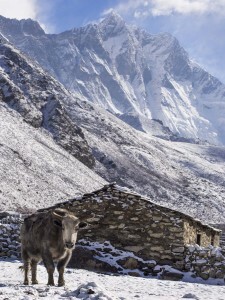 Kathmandu Valley Co. journals are crafted in the high altitudes of Nepal by skilled artisans. A rustic journal is much more than the finished product, it’s the process, the history, and the care that goes into making a journal that will carry your thoughts, sketches, art, or memories. It’s the meaning behind the journal you hold in your hands. Please consider choosing from our collection of leather journals.